After an extraordinarily bad day, I made a meal of comfort foods: mashed potatoes, nachos with pork belly and caramel sea salt gelato. I felt better, but as I watched TV and saw a character devour a chocolate cupcake, I thought, that’s what I want. I could have whipped up a batch, or made a whole cake, but that would have taken more time and effort than I was willing to give. I remembered reading about microwave mug cake; a super simple recipe where everything is dumped in to a mug, stirred and nuked. It promises a perfect, single serving confection, done in less time than a commercial break, but would it actually taste good? I was pleased to discover the cake was moist and had decent flavor. The texture was not perfect, and the presentation is not going to win any awards, but holding the mug and eating warm cake felt decadent (like eating ice cream from the pint container) and comforting. This is definitely a recipe to keep for those kinda of days. 1. Butter inside of a mug. Add 1 tablespoon butter, brown sugar, flour, cocoa, instant coffee, salt, baking soda, water, vanilla, and chips to the mug. Stir until completely combined. 2. Wipe inside rim of cup to remove excess batter. 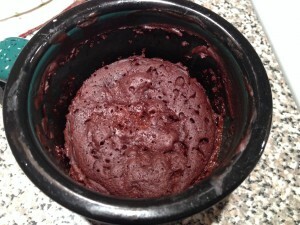 Microwave on High power until cake has risen and looks moist (not wet) on top, checking every 30 seconds, about 1 to 2 minutes. Avoid overcooking or it will be dry. Let rest to cool briefly before topping with ice cream and eating.